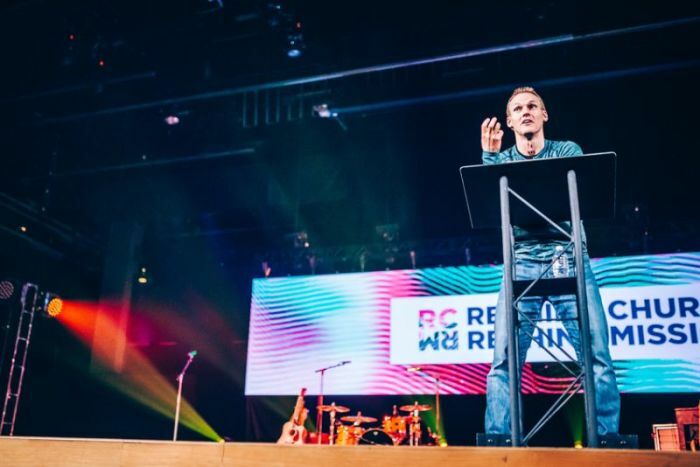 As part of the Rethink Church | Rethink Mission Conference held at McLean Bible Church in Vienna, Virginia, Pastor David Platt challenged Christians to go out into the world and proclaim God's name among the nations, bringing the dead to life "while we still have time." Platt, who serves as pastor teacher at McLean Bible Church and is the founder and president of Radical, began his message by asking attendees, "How convinced are you that you have been saved solely by God's grace and supremely for God's glory among the nations?" "The sole ground of salvation is the sovereign grace of God; the supreme aim of salvation is the global glory of God," he said, pointing out that in Ezekiel 36, God repeatedly uses the phrase "I will." God saves and restores His people — even when they sin against Him — because He wants His name proclaimed among the nations, the pastor contended. "The reason God saves His people from destruction is because God is zealous for the fame of His name among the nations," he said. "God loves His glory and desires His glory among all the nations. When God saves His people, He doesn't do it ultimately for their sake; He does it ultimately for His sake. God is for them because it brings great glory to Him." "This is not the way the 21st century Christian in America thinks about God," he added. "We think so highly of what we bring to the table ... The only reason we are here is because of the mercy of God, and He has shown us this mercy for the spread of His glory among the nations." The pastor acknowledged that such truths can be "uncomfortable" to acknowledge, but it's "more than appropriate for God to be God-centered." "The moment He were to exalt someone else, He would no longer be worthy of exaltation," Platt explained. "There is no one greater than Him ... If God is completely good and right and loving, all that is love is summed up in God, then what is the greatest gift He could give us? Enjoyment of Himself, worship of Himself, glory in Himself." Desiring the glory of God more than you love your own life, Platt said, will "change your Christianity." "God's written a whole book and designed all of His history to end with Him getting glory from all the nations for the grace He has shown," he said. Second, the Counter Culture author asked listeners: "How confident are you to make disciples and multiply churches without dependence on performances, programs, and professions?" "How is God going to glorify Himself among the nations? He's going to form a people who are forgiven of their sins," Platt said. However, Christianity doesn't end there, he said, pointing out that when God forgives people of their sins, He then pours His spirit into them. Every single follower of Christ has the Spirit and Word of God in them, the pastor emphasized, and thus has what it takes to obey the mission of God: Make His glory known as a witness in the world. "My concern is that we, if we're not careful in our thinking, we become unnecessarily and in some ways unhelpfully dependent on performances, programs, and professionals to do that which God has already equipped us to do," Platt said. "What might happen if you were suddenly planted in a remote or unreached part of the world where you didn't have a performance and you didn't have programs and you didn't have any professional ministers around you?" he asked. "Could you make disciples and gather them into a church that was focused on making disciples and multiplying that church?" As a pastor, Platt said he wants to prepare people to "be so confident in the Spirit of God in us and the Word of God in front of us to make disciples and multiply churches wherever God leads us in the world without relying on performances, programs, and professionals." "When that is the case, I think mission, according to God's design, takes off," he charged. "He is sufficient, so you can be confident." Finally, Platt asked attendees: "How desperate are you to see dead people come to life?" The dead come to life, the pastor said, when the people of God speak His word in the power of His spirit. "Think about where you live right now," he said. "You are not in that neighborhood or that apartment complex by accident. God is sovereign over everything, including the details of your life; He has the whole thing rigged, and He's put you [there] for a reason. There are people who are spiritually dead all around you." "How will they come to life? They come to life when servants of God are bold enough, desperate enough, to speak His Word to one of those people," he said. "We miss the point if we continue taking about how hard the ground is instead of how great our God is." When we are truly desperate to see the dead come to life, there will be an "urgency" in us to share the Gospel with others, Platt said. "Let us not be ignorant," he exhorted listeners. "This is not a game. There is real, eternal, everlasting judgment awaiting those who don't hear and believe this good news ... I plead with us to live with desperation to see the dead come to life." The pastor urged believers to make disciples, multiply churches, and make the dead come to life "while we still have time." "And as we do," he concluded, "we will experience the joy of proclaiming His grace and exalting His glory and fulfilling the purpose for which we live." The Rethink Church | Rethink Mission Conference is a one-day event with the stated aim of "casting a clear vision for every Christian to leverage their life for the church and mission," according to the website. In addition to Platt, the event featured Francis Chan, author of Crazy Love and founder of We Are Church, and Andrew Scott, author of Scatter and president of OM USA. For more resources or to access each of the sessions for free, visit crazylove.scatterglobal.com.